Over the years, I've written about lots of shopping cart applications from the outside looking in: summarize the program, talk to the CEO or founder, and get some quotes from a satisfied user. Not long ago, I had the chance to work with a shopping cart from the inside: making changes to the back end of an ecommerce website to improve shipping and edit the content of some pages. The shopping cart used on the website, WooCommerce, is unusual for a number of reasons. For one thing, it's free. For another, it's configured to work with a specific piece of software: WordPress, the very popular blogging and website creation tool. That's probably one reason why WooCommerce is so popular: it brings ecommerce to the many blogs and websites that are already being created with WordPress. It's easy to overlook WooCommerce when looking through a list of shopping carts. One reason is that WooCommerce isn't technically called a shopping cart. Rather, it's a "theme" for WordPress created and made freely downloadable by the South Africa-based developers at WooThemes. I tried several times to get the usual information from WooThemes about who created WooCommerce, when the company was founded, and so on. (You can read a cartoon describing the founding of WooThemes at WooThemes.com/about). One of the WooCommerce founders did get back to me (once) but didn't respond to questions. He's probably a very busy person and I don't want to draw conclusions from this. But having problems contacting the developer/author/founder of a piece of software that is made available freely on the Internet is generally more difficult than it is for users who have paid for the software. With many open source or free programs, getting support from the site developer often just doesn't work. For support, you have to turn to user forums. In the case of WooCommerce, there are lots of user forums and plenty of helpful individuals who will answer questions for you. That's one of the advantages of free software: instead of having to turn to the company's customer service area for help, you can refer to the many people who have installed the software before you and get help from them. With a popular program like WooCommerce, you're very likely to find someone who has encountered exactly the same problem you are facing. Shop. This is the basic page people see when they are shopping on your site. That is also the default name of the page - -pretty generic, but you can change the name using the Edit Page screen just as you would any other page. Cart. This page shows the shopper what's been stored in his or her shopping cart after selections have been made. Pay. This is the checkout page. Thanks. This page is sent to the shopper after the order has been submitted. My Account. If you want shoppers to create an account before shopping, they do so here. Edit Address. Customers can change their addresses here. 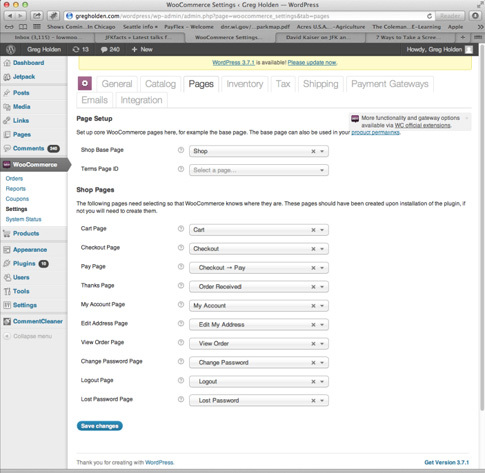 You can delete or change these pages in the Settings area under WooCommerce, as shown in the accompanying image. WooCommerce comes in two versions. The free theme can be downloaded and installed on an existing website. Depending on your design, the shopping cart, catalog, and other pages might not look quite right at first, however. You have to customize them to make them work with your existing design. The free version doesn't come with support. The paid WooCommerce themes typically start at $99. They are designed specifically to work with WooCommerce, and as a paying customer you get support from WooThemes, which is said to be quite good. In this article, I am only writing about the free version of WooCommerce. I didn't want to redesign my existing blog and website; I wanted to add WooCommerce on to it, so I used the free theme. The paid themes have superior documentation and perform better, and are a better option if you are creating a WordPress website with ecommerce from scratch. Import and export product lists. If you have a database of products in CSV format, you can install the Product CSV Import Suite extension, which starts at $199. Adjust and control shipping rates. Table Rate Shipping ($199) lets you set multiple shipping rates based on location, price, and other factors. Create a "Product of the Day." Promote a selected product each day with this $49 extension. Lack of documentation. Once WooCommerce is installed, you're on your own when it comes to learning how to use it. There is no formal "user guide" or customer service person. The documentation on the WooThemes website is helpful, but not terribly detailed. Lack of features. WooCommerce isn't set up for every variation; for some payment or shipping options, you need to install extensions. Which is best? It's up to you to do the research. You generally can't "try out" extensions for free. When I was researching extensions to solve a shipping problem, I did a lot of time-consuming research, only to find that I couldn't try out the programs I wanted for a free trial period to make sure they did what I wanted. I had to purchase them before even trying them. You aren't totally shielded from code. If you're a non-programmer and are frightened by the thought of working with PHP files, you might want to try a different application. Each of the shopping cart documents that make up WooCommerce is a file created in the programming language PHP. I mention that because, if you want to adjust or edit the templates that create these pages, or do some debugging. you have to work directly with those files, or find someone who knows PHP or a similar language (say, C++) to help you. That said, if you like WordPress and want to add ecommerce capability to your website or blog, WooCommerce is a good choice. A recently released 2.0 version includes improved security as well as many other features. There were some problems I had to solve. Once you get the program working, however, it's downright exciting to see orders come in and make your own sales. I saw orders that were coming in near-real time (for instance, only twenty minutes before) while I was working on the Virtual Book Signing website (http://virtualbooksigning.net), which sells signed books about President Abraham Lincoln, the Civil War, and other historical topics. Whether you are working for someone else's store or your own, it's well worth climbing the learning curve and trying out this flexible and powerful WordPress shopping cart.